The Transport Bill is an opportunity to take a radical look at integrated transport in Scotland. Sadly, the Bill as introduced falls somewhat short of this aim. The Scottish Government has introduced a Transport Bill to the Scottish Parliament. The main provisions are summarise in the UNISON Scotland briefing. Tackling the appalling air quality in our cities should be a government priority, given it could be contributing to around 15,000 early deaths in Scotland every year. The Bill puts the regulatory structure in place to introduce low emission zones. This is welcome, but the key challenge is to put in place real action to cut emissions. We don't need more plans about plans. Other provisions on integrated ticketing, ending (some) double parking and another go at regulating road works are worthy measures, but they are unlikely to make a significant difference. A key issue in the Bill will be the regulation and delivery of bus services. The Bill extends the powers of local authorities to run buses and develop bus partnership plans. The aim is to allow councils to act more flexibility to improve services, either by working with bus companies or by stepping in and running services themselves. Local buses are the most frequently used mode of public transport in Scotland. With 393 million passengers on local bus services, more journeys are made by local bus than by rail. However, there has been a dramatic fall in the number of journeys, down from 487 million in 2007. There has been a 10% reduction in past five years, which is double the reduction in Great Britain as a whole. Part of the reason has to be that bus travel is 65% more expensive in 2018 than in 2008, at a time when real household incomes have been falling. There has also been a 16% reduction in the number of buses in operation. So something is going seriously wrong in Scotland. While bus passengers are losing out the companies are not. They have just raised prices to cope with the decline in services and in any case 43% of bus company revenue comes directly from local or central government through grants and concessionary travel reimbursement. Bus companies argue that they offer competition. However, the Competition Commission’s 2011 report into local bus services said, “head to head competition between bus operators is uncommon", because of “customer conduct”. The worst, most irrational thing these difficult customers did was to ignore the choice of operators the free market had to offer, opting instead “to board the first bus to their destination that arrives at their bus stop" - there's a shock! While the Bill talks about the role of local authorities, the companies view it as an opportunity. That's because the Bill will allow private operators to cherry pick the profitable routes, leaving councils to pick up the bill for the rest. Ironically, the Scottish Government is following the English Tory policy in the Bus Services Act last year. In contrast, the public want government to go in the opposite direction. A recent poll shows clear public support for buses to be run by public operators - only 15% of Scots believe they should be run by private companies. Interestingly, almost half of Tory voters support public ownership. So, we don't need local partnerships, we need local public ownership. Publicly owned Lothian Buses is the best operator in Scotland, even getting the middle classes onto the bus. Levels of customer satisfaction for Lothian Buses are the highest in the industry and the publicly owned company recently returned £5.5 million to the public purse. This is one of the models we could adopt in Scotland, together with other non-profit initiatives like co-operatives. 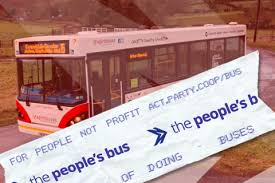 As the Co-operative Party's 'People's Bus' campaign shows, across the UK, co-operative, social enterprise and other forms of not-for-profit bus operators are proving that it’s possible to run bus services that are affordable and responsive to the needs of local people. Most recently in David Cameron's constituency of Whitney. If we are really serious about cutting vehicle emissions, how about free transit? This is an idea being piloted in Germany by “the end of this year at the latest”. Five cities across western Germany are involved, including former capital Bonn and industrial cities Essen and Mannheim. It won't be easy, but has some links to a new industrial strategy given the demand it would create for electric or hydrogen buses. It is difficult to accurately cost free local transit because a key element would be funding increased demand. Based on current funding and demand, it could be somewhere between £200m and £300m per annum and that doesn't take account of the savings from not having to pay for dividends and expensive borrowing. Not an impossible ask by any means and we should account for the preventative spending benefits from the emission reductions. Scotland needs a more integrated public transport system that results in a meaningful shift away from car use. Re-regulating buses and more public and community ownership would be helpful in doing this. In addition, we need green travel plans at work, with incentives for lower energy transport, cycling, car-share, public transport, walking and the use of lower emissions vehicles. We need a radical transport policy, not another dabble with market mechanisms.